In one word, this collection was magical. Stepping into the room, I felt like I’d wandered straight into an Alpine forest. Speakers were dotted around, emitting soft sounds of the wind, and wooden skis and vintage ski lifts were embedded in the centre of the displays. The shoes were placed carefully, either gently settled on a bed of soft snow, artfully angled on snow-covered rocks or placed on plinths atop branches of Alpine trees. There was a sense of intimacy and elegance, with the mirrored room and warm lights casting a glow akin to that of a fireplace and small, delicate spotlights shining on the shoes. Alpine touches can be seen on every piece, from glimmering Swarovski crystals forming knitwear patterns to slippers adorned with scattered pearl stones, reminding us of falling snow. 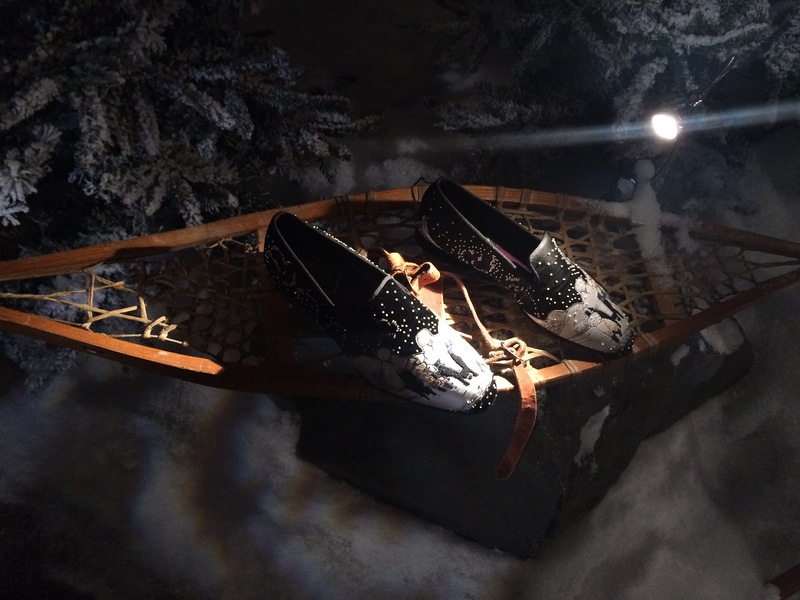 More literal inspiration was shown with an Alpine scene hand-embroidered onto a pair of silk slippers. When looking at the shapes of the shoes we were also transported to the world of Alpine Gentlemen’s Clubs, with slippers reminding us of warm nights inside a rustic lodge and chunky sneakers with a hexagonal pattern reminding us of ski boots themselves. Badges more commonly seen on ski jackets were delicately sewn onto brogues and buckles and zips were robust, reminding us of details on ski clothing. Tassels on shoes seemingly exploded in all directions, reminiscent of pom-poms on winter hats and mittens, and laces were thick and tough, being inspired by Alpine ropes. In truth, the entire collection was completely unforgettable from the beautiful shoes to the picturesque presentation style.